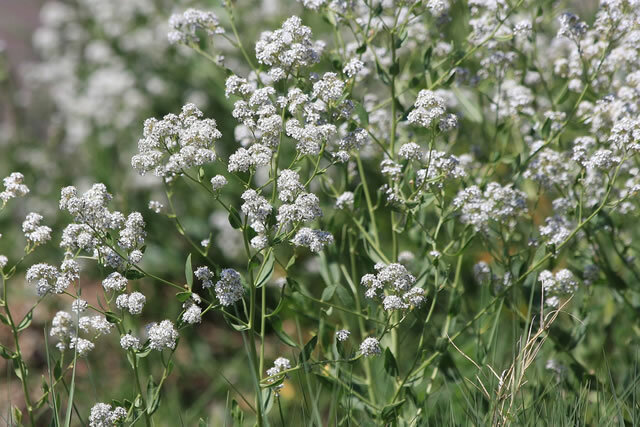 General Description: Perennial pepperweed normally grows 1 to 3 feet tall but may reach up to 6 feet. Flower Description: Flowers are milky white and are formed into dense rounded clusters at the branch tips. They have 4 sepals and 4 petals. Leaf Description: Leaves are alternate, waxy, and have smooth or toothed margins. They have a prominent whitish midvein. Stem Description: Multiple stems emerge from a woody base. Fruit/Seed Description: Rounded to egg-shaped silicles (seed pods) form that are compressed and 0.09 inches (2.4 mm) long. Silicles with stigma present at tip. It forms dense infestations that can turn into monocultures. Accumulations of its semi-woody stems degrade nesting habitat for wildlife. It can also displace more desirable species which poses a particular threat to natural areas and hay meadows.